I like sea glass….a lot. I have walked hours and miles to beat the tide to collect these rare treasures. The theme for my wedding last year was beach glass – muted blues and greens. I collected sea glass myself over the course of a year from my special beach for the boutonnieres and the wedding gifts. 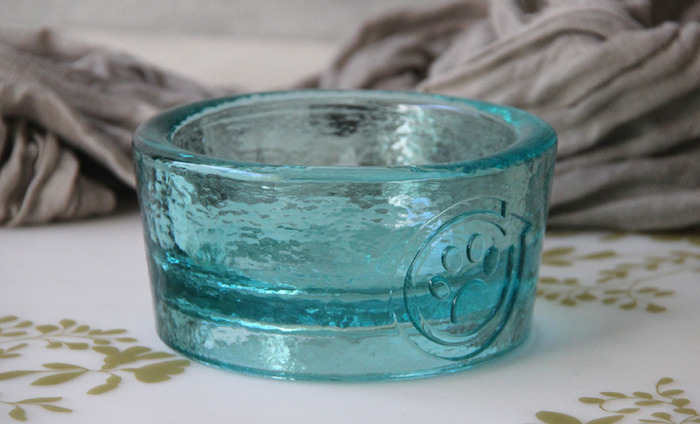 I fell in love last week when I discovered the PawNosh recycled glass pet bowl. How could I not? These bowls bring two things that move me together – A sea-glass look and protecting the environment. These bowls are made in the US of 100% post-consumer recycled glass – keeping trash out of our landfills. I don’t know how they do it but after the glass is melted and mixed together it has a blue tint reminiscent of faint blue antique glass bottles. The Cubby bowl has a diameter of 5.8 inches and is a little over 3 inches high. Each bowl is made by hand using cast iron processing molds and is one-of-a-kind. It is embellished with a cute little paw print on the outside ( looks like it is encircled in a recycling symbol) and has a groove underneath so it is easy to pick up. 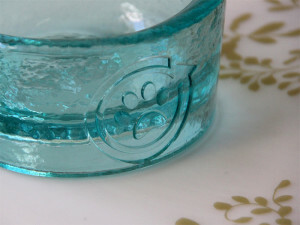 It is made with non-toxic glass and it is dishwasher safe. It is guaranteed not to break either. The walls of this bowl are ½ inch thick! I bought a bowl but unfortunately it is not born yet. 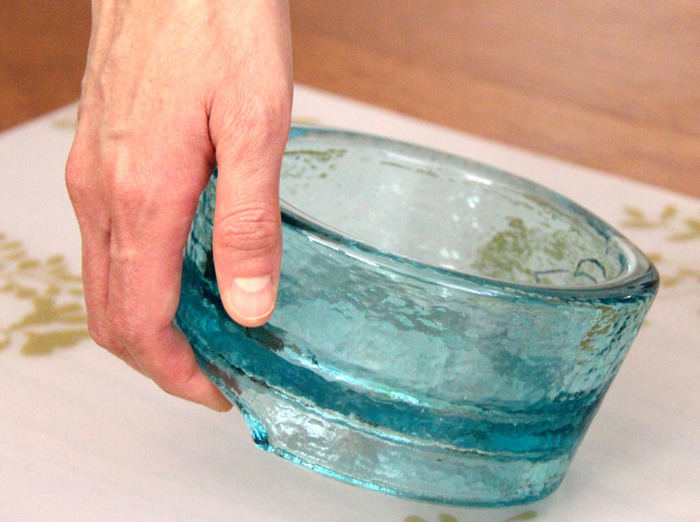 I found these bowls on Kickstarter – a crowdfunding website for creative projects. In this case, that means that the company I bought the bowl from needs to raise some money before they can open up shop and start production on these bowls. I bought a dream. PawNosh has raised 70% of their fundraising goal. They only have 19 days left to get the rest of the way. I wanted to tell you about these bowls so you can buy one if you like them as much as I do and turn the dream of this company into reality (I am told that they will find a way to make the small bowls even if the funding goal isn’t reached). If you want to get a bowl, visit the PawNosh Kickstarter page. The way Kickstarter works is that you give money to help to fund a certain amount of the project. For each dollar amount you contribute you get something in return for your funding. If you contribute $1 you get a thanks. If you contribute $62 or more you will receive a pet bowl when they go into production (the “benefits” package is bigger the more you give and there is an option for a larger, deluxe bowl). Love, love, love that bowl!! Yah! mom saw this at Kickstarter too. It is a thick glass. Hope they get their funds so you’ll get your bowl. I love seaglass too and that bowl is gorgeous! I bet your wedding was too! I have always loved the beach. I have collected beach rocks since I was a kid. I ended up with too many rocks though so I needed something more rare 🙂 There are a few beaches around here where finding beach glass is really common (well, as common as beach glass can be). I saw these somewhere else, too! I agree, they sound like they’d be fabulous! DogMilk featured them a week or so ago. That is how I discovered them. Maybe you saw them there? The only issue would be using it as a water bowl, my mom might want to drink out of it. They are beautiful and fun all in one! Love that!! Love the color!! I’ll have to check that out. I have been collecting beach glass from beaches all over the world since I was a kid too!!! There isn’t a room in my house that doesn’t have container of collected beach glass adorning it. And this bowl is definitely the perfect compliment. I am heading to the Kickstarter page right now! That is so awesome! I didn’t start collecting until later so I only have a couple containers around my house. Also, I needed to downsize at one point so I got rid of all the brown and green glass and most of the white. All I have are “special” whites and a couple containers of light blues and greens…the rarest kind anyway 🙂 It’s just so beautiful. Where do you live that there is so much beach glass? I started collecting when we lived on Howe Sound in BC and continued when we moved to Richmond Beach here in WA. When I was a teen/young adult, I spent a ton of time on Alki, where I always wanted to live and now do! We spent our summers in Western NY so I have a lot of Lake Erie and Lake Ontario glass too. I use a lot of the less special pieces for outside garden decor. I just didn’t know if you knew of any “mother lode” glass beaches around here….not that you would spill the beans 🙂 Do you mean Richmond Beach up by Shoreline? I used to work at that beach (water quality) sometimes. I didn’t know you could find beach glass there. Actually, I would share any beach glass treasure troves if I knew of any. I think living (and working) so close to the beaches has meant I get to be there at prime times (usually lowish tides) and it also means I just got to be there often. Since dogs aren’t allowed on City of Seattle beaches, I don’t comb very often around here anymore. Oh! And, yes, Richmond Beach in Shoreline. Lowish tide is a good time for beach glass there. And it is an off-leash dog beach in the winter! Yes, I know about the beach being dog friendly. I was in charge of helping the parks department demonstrate to the council that an off-leash park wouldn’t significantly degrade the water quality. I monitored the water quality monthly after it was “put in” 🙂 I don’t work there anymore though. You know, I’ve never heard of ‘sea glass’ but what a beautiful bowl! Wow!! The bowl is very pretty, I love it too! I’ll have to get my mom to check out their kickstart. Wow, what a beautiful bowl! So creative. I hope you get one soon! You know, these look great! I hope they get funded and can make big bowls!! Those are beautiful! I have a soft spot for sea glass as well because of the fishing net floats my mom saved from her childhood in Hawaii. Some of them still have the original netting around them. I have some old glass floats too that were my Grandma’s. I never really knew where she got them but she did live in Hawaii when the Pearl Harbor bombing happened (my Grandpa was in the Navy). Perhaps she brought them back from there. One is 10 or 12 inches in diameter with the netting still on it. That is a great bowl! And I love the eco-friendly aspect. I LOVE sea glass and have collected it since I could walk, since I grew up near the beach. I used to walk the beach with my kindergarten teacher, so now that I’m not near the beach anymore, she sends me a bag of sea glass every now and then. Such a neat surprise when some shows up in the mail.